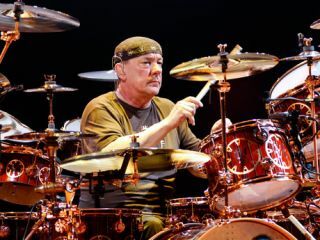 When we last spoke with Rush's Neil Peart, he was about to let loose for Drum Solos Week on The Late Show With David Letterman, during which he was planning to strike a balance between compositional and improvisational playing. "About the process, though, I can't resist spilling a little. It was our second time working with the production team of Nick 'Booujzhe' Raskulinecz and engineer Rich 'Tweak' Chycki. Beginning with a confident level of trust allowed us to reach higher, and I recorded my drum parts in a way that, for me, was completely different than ever before. "Even right up to our previous album, Snakes and Arrows (2007), my method was to take a demo version Alex and Geddy had made of each song and play along with it many, many times. I would experiment with possible rhythms and decorations, and gradually organize them into an arrangement. At that point, I might start recording demos myself—often with Alex as engineer—and improve them over time, with input from my bandmates and coproducer (Booujzhe, in that case). "Rush songs tend to have complicated arrangements, with odd numbers of beats, bars, and measures all over the place, and our latest songs are no different (maybe worse—or better, depending). In the past, much of my preparation time would be spent just learning all that. "This time I handed that job over to Booujzhe. (And he loved it!) I would attack the drums, responding to his enthusiasm, and his suggestions between takes, and together we would hammer out the basic architecture of the part. His baton would conduct me into choruses, half-time bridges, and double-time outros and so on—so I didn't have to worry about their durations. No counting, and no endless repetition. What a revelation! What a relief!"